St. Cuthbert, an early Celtic Saint, used to pray standing in the sea. When he stepped out, the sea otters would dry his feet with their fur. * Sobering words upon moving to a new house, to a new job and to new ministries. “The one thing that sets the Saints apart from the rest of us is their struggle to remain entirely obedient to Christ. There is no bargaining in their mind, no negotiating Christ’s teaching, no diluting His words to the point where they lose the strength to open for us the path of salvation. Icon of St. Winifred, painted by a modern Orthodox iconographer. St. Winifred, whose name in her own language was Gwenfrewi, was born in North Wales in the early seventh century, when Christendom was still whole, and many great saints where living on the British Isles. She was of noble lineage, a descendant of the early Welsh kings of Powys, and the only daughter of Tyfid, Lord of the townships of Abeluyc (Trefynnon, later named Holywell), Maenwen & Gwenffynnon in Tegeingl. Her mother’s brother was St. Beuno, Abbot of Clynnog Fawr in Gwynedd. After difficulties he had encountered from the local princes of Clynnog, St. Beuno sought refuge with his sister’s family, and thus received land from her husband, Tyfid. From an early age, Winifred was instructed in the spiritual life by her uncle, and her sole desire was to dedicate herself to God and become a nun. She lived under St. Beuno’s care, near a chapel he had built in her native town of Abeluyc. A spring of healing water sprang forth at the place where St. Winifred’s head fell. St. Beuno took Winifred’ head and replaced it to her body, then prayed to God that she be restored whole. By St. Beuno’s prayers, Winifred came back to life. The two sat on a rock which was later named, “St. Beuno’s rock,” and her uncle told her that anyone seeking help through her prayers at that spot would find it. A red mark remained around her neck, as a remnant of her miraculous restoration. With her parents’ blessing, Winifred soon received the monastic tonsure at her uncle’s hand. St. Beuno advised Winfred to remain at that church to live the monastic life, which she did, eventually gathering around her eleven honorable virgins, and instructing them in the Christian faith. St. Beuno himself became a missionary, traveling west to Ireland. 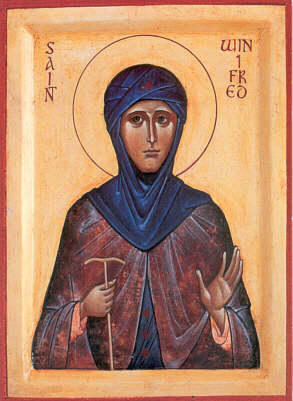 St. Winifred made a pilgrimage to Rome, and was greatly influenced by the order of monastic life there. When she returned home, she called a synod known as the “Synod of Winifred,” attended by other Christian ascetics of Wales, Dumnonia, and the North. The common ascetic practice in Wales at the time was the eremitic life. At the synod, all agreed that the safety of the coenobitic life she led was preferable to the solitary life. Thus, after seven years in Abeluyc, Winifred decided to go out and help establish other coenobitic communities. It is said that two hermits she approached with the idea, Sts. Diheufyr and Sadwrn, were not interested in what seemed to them an innovation. It was not until she reached Gwytherin that she was welcomed by her mother’s cousin, St. Eleri. Here, Winifred was presented to his mother, St. Tenoi, and together they established a double monastery in the village. Winifred eventually succeeded St. Tenoi as abbess there. St. Winifred reposed on November 3, 660 AD, and was buried in the monastic cemetery. Recently a fragment of an eighth-century reliquary from Gwytherin, the Arch Gwenfrewi (Winifred’s Casket), was found, witnessing her status as a recognized saint almost from the moment of her death, the earliest such surviving evidence for any Welsh saint. Veneration of the saint was mainly limited to Wales until the late eleventh, early twelfth century, when it began spreading throughout the British Isles. Other wells have been recorded as dedicated to her, including one in Dublin, Ireland. In 1136. Her relics were translated to an ornate shrine in Shrewsbury, while her original tomb was retained at Gwytherin and a fragment at Holywell. The spring that had broken forth in Holywell on the site where her severed head fell is still active; the temperature of the water never changes, summer or winter, and the supply remains constant regardless of drought or flood in the locality. It is so clear that the pebbles at the bottom are distinctly seen to be stained as though with blood. It is lined with fragrant moss, the Jungermannia oplevoides. Holy springs are still a strong tradition in Orthodox countries—among them are the spring of St. Athanasius on Mt. Athos, the spring of St. Theodora of Vasta in Peloponnesus, and the many holy springs connected with saints and the Mother of God in Russia. History shows that there were also many holy springs in Britain during its pre-schism period, but the miraculous spring of St. Winifred is now one of a kind there. The following description of her spring in the town which is now named for it, Holywell, is from Source, “Holywell – Clwyd” by Roy Fry & Tristan Gray Hulse. The healing pool at Holywell, Wales. Photo by Jeffrey L. Thomas, 2006. 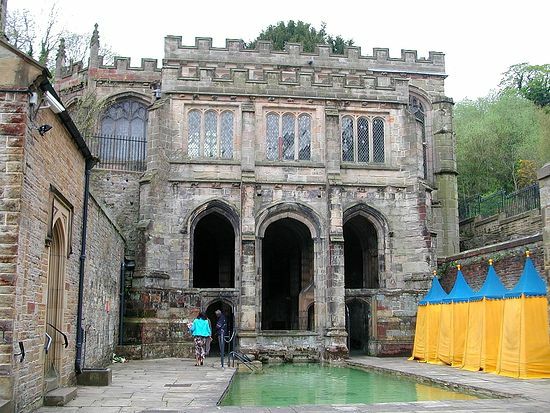 HOLYWELLHolywell first enters written history in 1093, when “Haliwel” was presented to St. Werburgh’s Abbey, Chester. In 1240, the Welsh prince Dafydd ap Llewelyn, once more in control of this area in Wales, gave the holy well and church to the newly-established Basingwerk Abbey; and the Cistercian monks cared for the well and its pilgrims until the Reformation. Such glory was short lived, though the Well’s fame was never eclipsed. The Reformation swept away shrines and pilgrimages; but no attempt ever quite succeeded in destroying devotion to St. Winifred at her Well. Through all the years of religious persecution, pilgrims, Catholic and non-Catholic alike, continued to visit Holywell. It became the centre of Catholic resistance. James II and his queen visited the Well in 1686, to pray for an heir. But James was exiled, and the persecution renewed. Through these long years, Holywell and its pilgrims were served by the Jesuits. They wrote popular Lives of the saint; and even kept inns in the town, where Mass could be said in comparative safety. St. Winifred’s well. Photo by Jeffrey L. Thomas, 2006. The present glorious structure was begun around 1500 and probably took ten or fifteen years to complete. It is unique, having no parallel anywhere in Europe; and is a masterpiece of late Perpendicular architecture. It takes the form of an almost square crypt, built into the steep hillside, but open to the North through a triple arcade which gives access to the Well. In the centre the spring rises in a star-shaped basin, before flowing into an oblong bath, access to which is gained at either end by steps. All around the Well, graceful columns rise to support the elaborately vaulted roof; and in the centre, directly over the source, is a large pendent boss, beautifully carved with the legend of St Winifred, but now badly worn. Originally, the spaces between the columns were filled with delicate Gothic tracery, destroyed by the Puritans. An open gallery in the west wall originally gave the pilgrim his first glimpse of the holy well as he descended from the chapel above, to enter the crypt through the now closed door. People have bathed in St Winifred’s Well for 1,350 years. They still do. Pilgrims today pass three times through the small inner bath, saying a decade of the Rosary; afterwards entering the outer pool to finish their prayers kneeling on St Beuno’s Stone, by the steps. 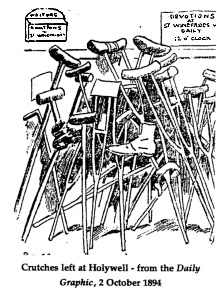 Some pray for a cure; more “offer up” the discomfort of the icy waters for friends, or simply in honour of St. Winifred, or as a gesture of thanks. Pilgrimage has many reasons. This ritual is as old as the pilgrimage itself. Maen Beuno, Beuno’s Stone, connects us directly with the time of St Winifred. 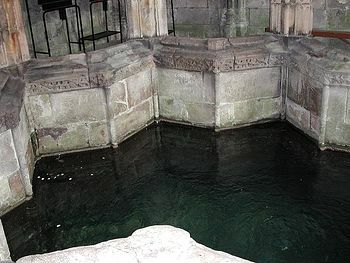 The Medieval Lives say that Beuno sat on this stone when he told Winifred that anyone coming to the Well and asking something in her name, “might receive an answer to their request at least at the third time.” This was understood to mean that the petitioner should bathe three separate times. After the building of the present Well this meant three dips in the little bath. A carving opposite this bath shows how healthy pilgrims carried the sick through the waters on their backs. The stonework of the Well is covered with hundreds of graffiti, initials of hopeful or grateful pilgrims. Some inscriptions explicitly testify to cures received at the shrine. A Protestant Father wishes to return thanks to God that through the use of St Winifred’s water, his only daughter was cured miraculously, Three years ago of a serious malady, which had resisted the efforts of several doctors & friends for the period of Three and a half years. Signed, C.T. Longley. Britannia Biographies, http://www.britannia.com/bios/ebk/winifred.html. Partly edited from Agnes Dunbar’s A Dictionary of Saintly Women (1904). Are you Afraid? Yesterday I took a long walk by the promenade. It was dusk, and the tired sun sparkled gold across the ripples of a gentle sea. The sea was basking in an orange sunset. Watching the seagulls’ gliding and soaring was mesmerising. I just stopped and let it sink deep into my heart . It brought such peace, freedom and joy to me! No video can do justice to the Beauty of their flight! And for a hundred visions and revisions … which a minute will reverse. … Have the strength to force the moment to its crisis? … And in short, I was afraid. Three things we need in life: first, Faith; second, Faith; third, Faith. Now, if they said, “And who are you? Why should we lose what we have? Why should we lose our profit? Where will you take us? What will you do with us?”—if they had said that, what would have happened? They would have remained in darkness. They said Yes to the Unknown who came and said, “Throw all that away!” Why? Because they believed in God, and they waited for the One who would say to them, “Come!” And that was the beginning. … He said to us, “Why do you worry? … Even the hairs of your head are numbered!” Why worry? Faith is lacking. May we have faith.